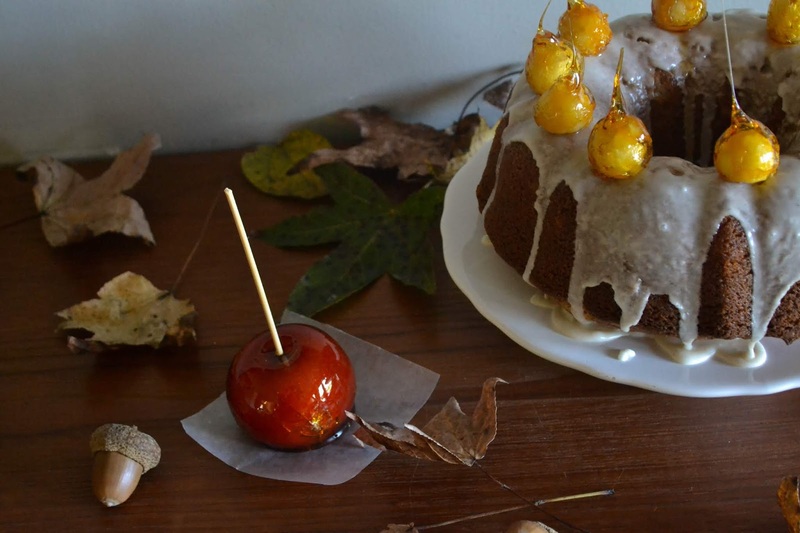 Nothing says "October" to me like a well-spiced apple cake. I always forget that October is coming until October comes and gives me a delightful, visceral shock. October is a fairy tale to me: spun gold and jewel-colors on the trees and wood smoke on the air. It's a time of year that makes me feel steady and ancient and invincible, like I could very well exist in either 1218 or 2018 with very few differences between the two. As a month, October is free from all major holidays (who actually counts Halloween? ), leaving ample time to lounge around campfires, hover over candles, and (most importantly) to lay flat on my back in dewy grass to look at the stars or the well-endowed hunter moon. I love it. I love everything about those thirty-one days bridging September and November. I love the food, the flavors, the temperatures, the fact that I can finally wear my favorite sweaters and not turn into a puddle every time I step out the front door. In fact, the other morning - because of October - I pulled an emerald green sweater over my head and onto my body. The sweater has been sitting in my room all summer, waiting to be worn; it belonged to my grandmother who died in the early part of this year, and it still smells like her. I stood there, sleepily cocooned in a sweater that felt like one of her hugs, and it struck me that it has been six months - more than six months - since I last saw her. The sweater won't smell like Grandmama forever and so, to make the illusion of her closeness last a little while longer, I peeled off the sweater, laid it back on the shelf, and chose something else. October feels like her too; it was one of her favorite months of the year. She always liked the things that came with October - the arts, long books, hot tea, classical music, sewing, the library. I spent the first day of October pottering around the kitchen in bare feet, mixing apple cake and making tiny toffee apples to put on top. A giant vat of our autumnal beef stew simmered on the back of the stove. It was still hot outside, of course, but it smelled and tasted of fall at last. I cook so much these days, you'd think I'd be tired of it when I get home. But the kitchen has become as much a part of my life as breathing. To go a whole day without some variety of cooking project is something I no longer do. For today's recipe, I dug deep in the archives of the recipe box I've kept since I was ten years old. Most of these recipes no longer reflect the way I eat and cook, but there are a select few recipes that I still occasionally crave and it's so fun to revisit the Rachel of fifteen years ago and find those oil-splashed, flour-dusty recipe cards. Having so much more of a scientific grip on why baking works the way it works, I find it interesting to uproot some of these recipes and realize why the sometimes obscure ingredients list actually works. 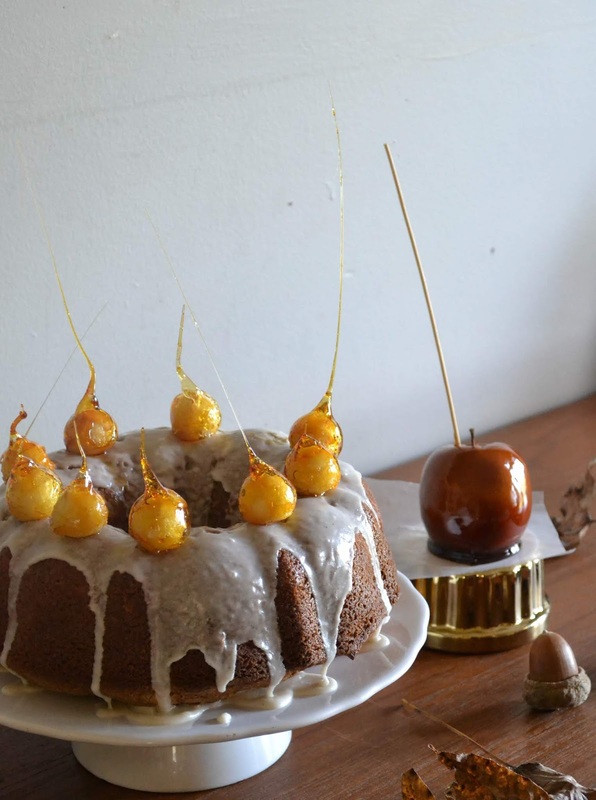 Take today's cake: rather than butter or shortening or even oil, the harvest apple cake calls for mayonnaise. As a child of the 90's, I was taught that mayo was a thing detrimental to health and should never ever be used if at all possible. To my surprise, I grew up in a world that now counts homemade mayonnaise in an ever-expanding list of healthy fats that we are supposed to consume. 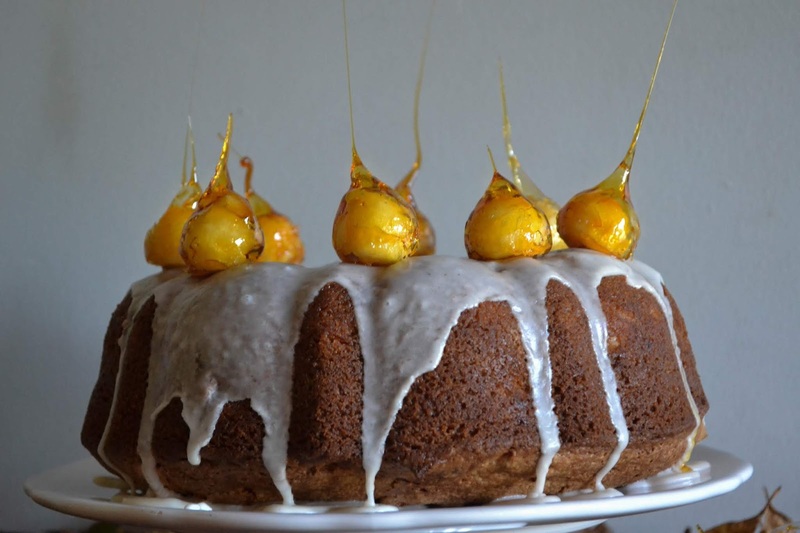 In this recipe, the fats from the oil-and-egg emulsion known as mayonnaise help to keep the crumb of this cake tender, soft, and extra moist, serving the same purpose that butter or oil typically serves in coating the flour molecules with fat to prevent long strands of stretchy, chewy gluten from forming. Mayonnaise- who knew, right? I love that particular feature of this recipe because it means that if I'm standing in front of the fridge and woefully notice that I don't have any butter left, all is not lost. 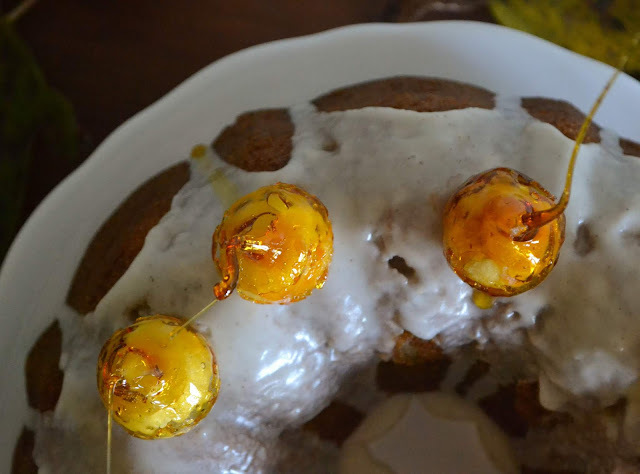 The tart flavor of jazz apples runs through this cake and a light, cinnamon-specked glaze flows over the sides. I hope you'll make this cake just to share with your family and friends - the beauty of a bundt cake is how many people it serves! 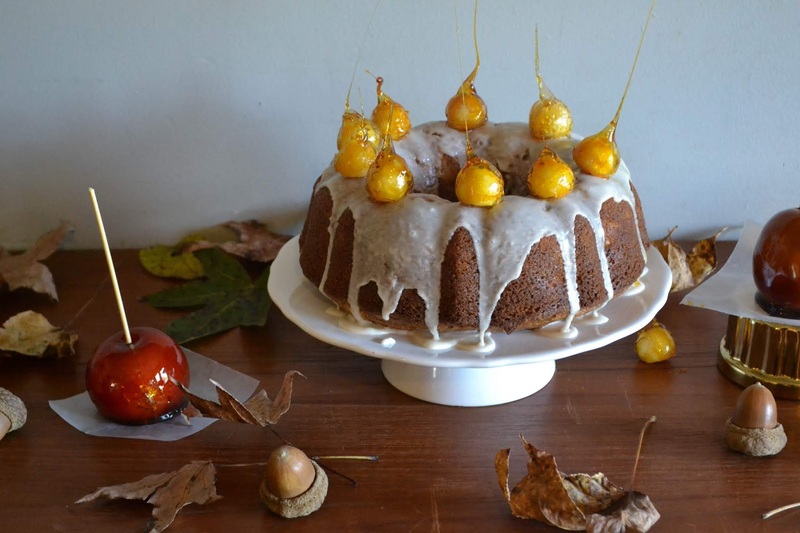 This cake easily serves twelve people a decent slice, ensuring that you'll soon be the favorite coworker, daughter, son, or boyfriend in all the land. 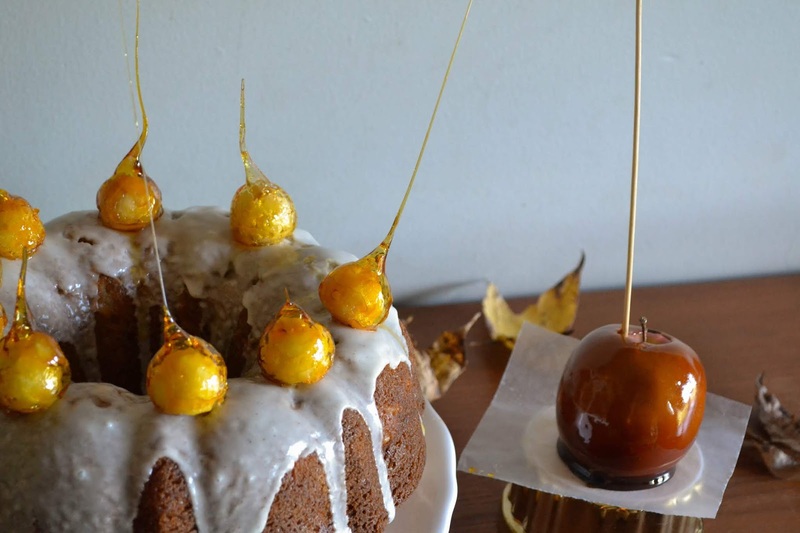 A note on the toffee apples: I did not include them in the recipe notes, as they truly have nothing to do with the recipe. If you care to make toffee apples yourself, I followed the basic instructions outlined in this video, altering it by scooping small "apples" out of peeled apples with a melon baller. The heat from the hot toffee caused the mini apples to release moisture which, in turn, dissolved the toffee after a little, so although the method is beautiful, it certainly isn't fail-safe. 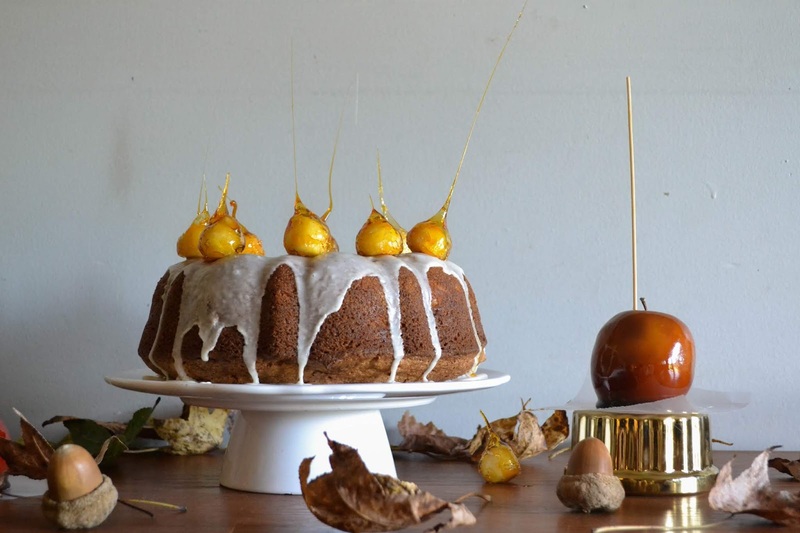 I would love to try this again with crab-apples, as it is a gloriously striking effect. Have fun with the toffee-making - it truly is easier than it appears! Preheat oven to 350 degrees F. Liberally grease your bundt pan and set aside. In a medium-sized bowl, whisk together flour, spices, salt, baking soda, and baking powder. Set aside. Mix together all wet ingredients except apples. Stirring by hand, slowly add dry ingredients to wet ingredients, mixing till just combined. 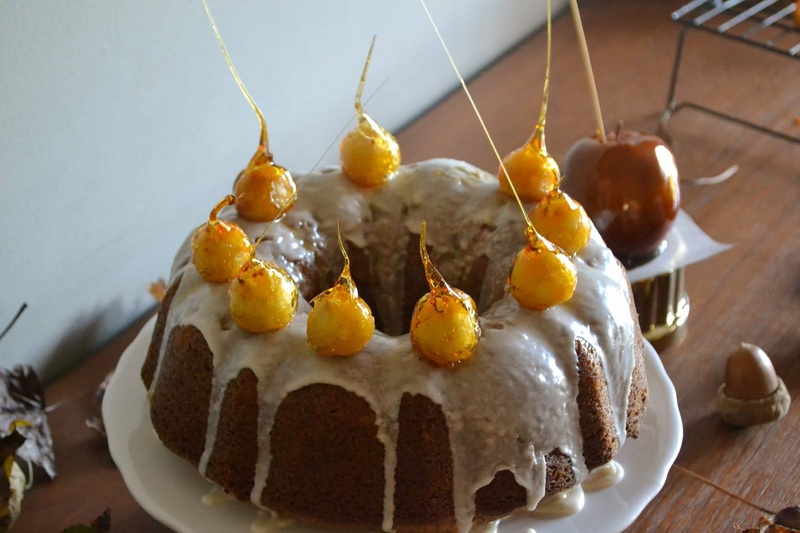 Fold in chopped apples and pour batter into bundt pan. 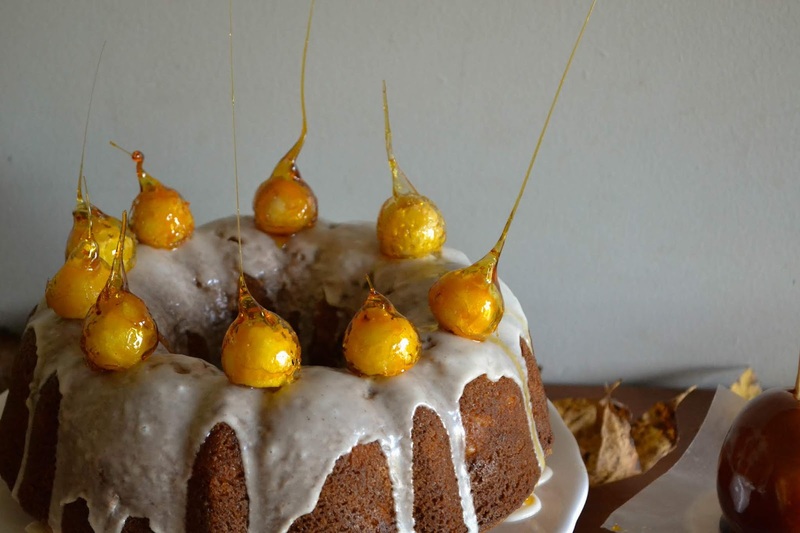 Bake for 45-55 minutes, until a toothpick inserted in the center of the cake comes out clean. 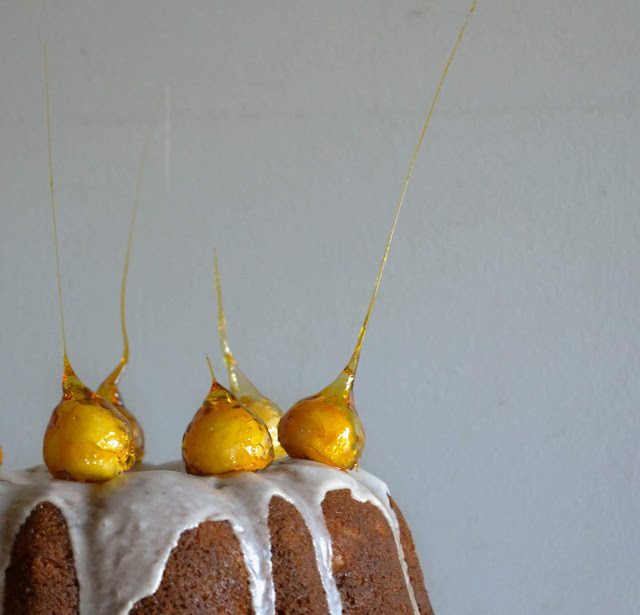 Allow to cool completely before attempting to flip out of the bundt pan. To make glaze, whisk together powdered sugar, cinnamon, and heavy cream. Spoon over cooled cake and allow to set slightly before serving.